The sea container shelter helps shield your equipment, vehicles, machinery, and materials from the harsh weather. 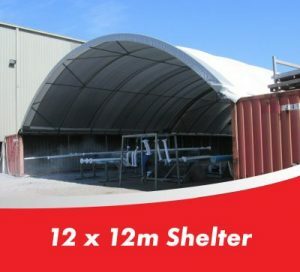 Our shelters are robust dome structures that are bolted onto the sides of two parallel containers. They are built to withstand the severity of the elements, from chills and hail to the mind-boggling heat. This inventive solution ensures the longevity of your items, and is easily installed, removed, and relocated for your convenience. You can shift these structures from project to project with no hassle! 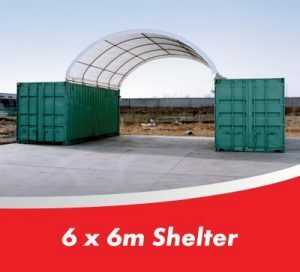 The container shelter allows protection while the supporting containers provide functionality; as site offices, accommodation spaces, storage solutions, workshops, etc. Our shelters are available in fabric and steel, and come in a range of sizes, to suit your site area. Our container shelters are designed to endure the callous Australian climate and provide excellent coverage from nature. There are a number of sizes for the commercial and domestic selection, starting from 6 metres wide and ranging to 17 meters wide. 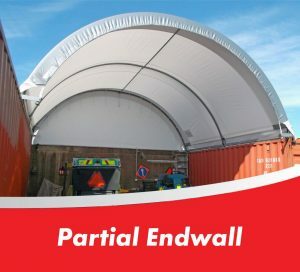 The steel shelters are endowed with a strong steel frame, while the polyethylene fabric shelters are composed of a protective, waterproof, UV Block-out Fabric. Both shelters are made from recyclable materials, are environmentally friendly, and provide an exceptional defence from wind and rain. 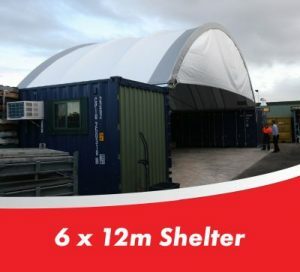 Sea Containers offers shelter accessories and ideas that can help modify your shelter to meet your business and personal demands. A partial end wall covers one opening, between the two supporting containers. If you are utilising three containers, this is a viable and smart option. The partial end wall stops the sunlight falling onto your items, in the afternoon. 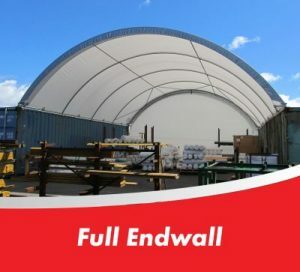 The full end wall stops sunlight from entering altogether, and helps create a cooler environment in the summer days. A personnel access door can be installed in the end wall for rear access. 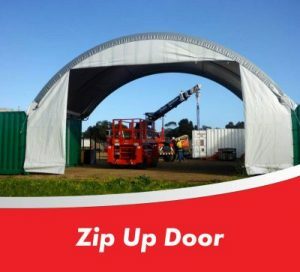 The shelter zip up door is a way to cover and uncover the site with ease. Unlike the end wall option, the zip up door can be drawn back at any time. If the container shelter is too low for your site requirements, stack two containers on top of one another. This will give you an additional 5.2 metres and extra container space. The container shelter makes for a quick and simple installation. The time of the installation process will depend on the size of cover you require and the accurate placement of the two containers. It is necessary to line the containers directly parallel to one another and on a level surface, in order for the installation to take place. No footings are required, as the containers are a solid foundation. The shelter may be welded or bolted to the containers. Bolting is preferred, as is allows for the shelter to be removed and relocated to another site. Sea containers can arrange for a subcontractor to take over the installation, or you can choose to erect it yourself, with the help of a few handymen.  Our instructions guide is easy to follow and many of our clients have completed the task in half a day. If you need some guidance, require a quote for your site, or have questions about our products, don’t hesitate to give us a call on 0861663597.